For the TV presenter, see Joe Morrison (TV presenter). 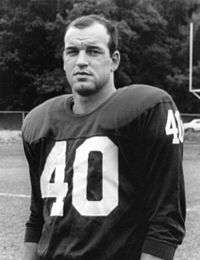 Joseph R. Morrison (August 21, 1937 – February 5, 1989) was an American football player and coach. He played professionally in the National Football League (NFL) for the New York Giants from 1959 to 1972. Morrison served as the head football coach at the University of Tennessee at Chattanooga from 1973 to 1979, at the University of New Mexico from 1980 to 1982, and at the University of South Carolina from 1983 to 1988, compiling a career college football coach record of 101–72–7. Morrison was born in Lima, Ohio. He attended the University of Cincinnati where he played both halfback and quarterback and also played on defense during his three varsity seasons. Morrison was drafted by the Giants in the third round of the 1959 NFL Draft, where he mostly played at the positions of running back and wide receiver. He had a long career with the Giants, playing from 1959 to 1972. He is 3rd on the Giants' team record for receptions, with 395 catches, from seven different quarterbacks; over his career his plays gained 4,993 yards. His jersey number (#40) has been retired by the Giants. Morrison's best individual season as a receiver came in 1966 when the Giants won only one game. He caught 46 passes for 724 yards and scored six touchdowns. While the Giants fell on hard times, Morrison was one of the bright stars on the team. He also had five seasons of forty receptions or more between 1964 and 1971. Because he played many positions as needed for the Giants, he was nicknamed "Old Dependable." Joe Morrison was a head coach at the University of Tennessee at Chattanooga, University of New Mexico, and University of South Carolina. He is one of the few major college head coaches to never work as an assistant coach. Other than his NFL years, he is best remembered as the head coach at South Carolina. Morrison came to USC after three seasons with the Lobos of the University of New Mexico. He was a hot prospect, having gone 10-1 in 1982. Morrison took the Gamecocks to three postseason games (1984 and 1987 Gator Bowl and the 1988 Liberty Bowl) during his tenure. It was under Morrison in 1983 that South Carolina began the tradition of Einleitung from Also Sprach Zarathustra (theme from the movie "2001: A Space Odyssey") as its pre-game anthem and entrance song. The idea had actually originated with former quarterback Tommy Suggs, who suggested it to then-coach and athletic director Jim Carlen in 1981. However, Carlen wanted the Carolina Band to play it rather than have it played over the stadium's sound system. When Carlen left after the season, Suggs took the idea to his successor as athletic director, Bob Marcum. While Marcum liked it, he suggested that they wait to play it until a brand-new sound system could be installed in 1982. The song was finally played for the first time in Morrison's first year, and partly because of his success the song is identified with him. Morrison's second season, 1984, was until the turn of the century reckoned as the greatest in school history. It was affectionately dubbed the "Black Magic" year by South Carolina fans because of the team's success and because of Morrison's famous all-black attire (cap, shirt, pants). The team ran a streak of nine consecutive wins (longest single season streak in school history) and was ranked #2 in the nation before being upset by Navy and later falling to Oklahoma State University in the Gator Bowl. Gaining victories against storied programs such as Georgia, Pittsburgh, Notre Dame, Florida State, and arch-rival Clemson, the Gamecocks finished that season with a 10-2 record, which would remain a school record for wins until 2011. Morrison was named by the Walter Camp Foundation as the 1984 National College Football Coach of the Year. Morrison would also be named the Southern Independent Coach of the year in 1987. The 1984 squad also heralded two first team All-American players in James Seawright (linebacker) and Del Wilkes (offensive lineman), as well as future NFL players Sterling Sharpe (1984–1987), and Brad Edwards (1984–1987). Other notable players coached by Morrison included Harold Green, who spent several years with the Cincinnati Bengals in the NFL, current Gamecock football radio broadcaster Todd Ellis, who is the all-time passing leader at South Carolina, and Robert Brooks, who was part of the Green Bay Packers 1997 Super Bowl Championship team. During this time, Charlie Weis, former head coach of the University of Notre Dame and the University of Kansas, was an assistant coach under Morrison, his first coaching job in the college ranks. Also serving as an assistant during Morrison's tenure was Al Groh, who went on to be head coach of the New York Jets, the University of Virginia, and the University of Miami. After back-to-back 8-4 season in 1987 and 1988, expectations were high in Columbia for the 1989 campaign. However, it would not come to pass as Morrison collapsed after playing racquetball at Williams-Brice Stadium, and died on February 5, 1989, at age 51 from congestive heart failure. Morrison won his 100th game as a coach in 1988, when South Carolina beat N.C. State 23-7. Black jerseys as part of uniform options are used in football and all sports. The use of Einleitung from Also sprach Zarathustra, Op. 30 (theme from "2001: A Space Odyssey") was a tradition started by Morrison for the football team's pre-game entrance and is still done so today. The theme has been spread to other sports and university functions, including graduations, where it is played to recognise graduates. An outstanding football player from spring practice on both offense and defense are awarded the "Joe Morrison Award" each year.